Actually, Mastermind is one of my hidden passions in life! You did an excellent job making this, I can't think of single thing you can improve it in. 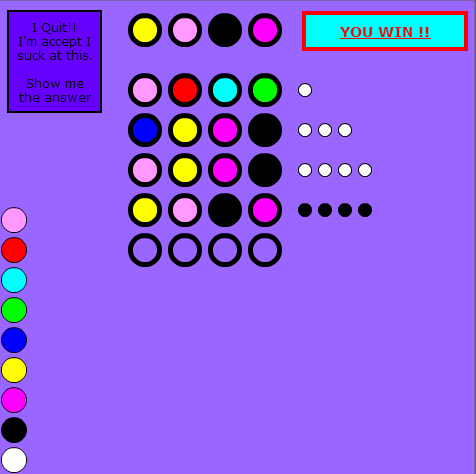 I`ve never heard of rule "the feedback does not tell you which dot corresponds to which peg", but it`s more interesting like that! That`s good implementation. 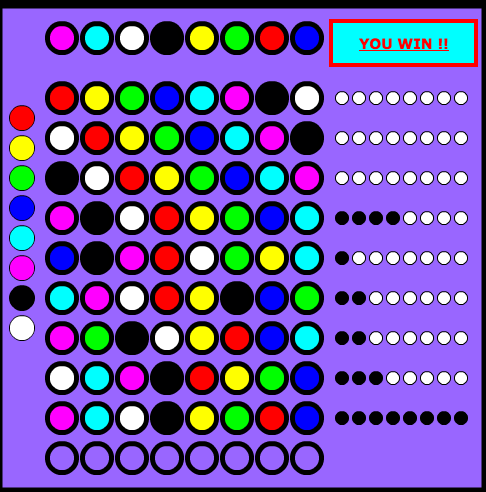 I have a suggestion: make 2-player mode, where one player sets hidden pegs and another guesses (dots are set by the computer). 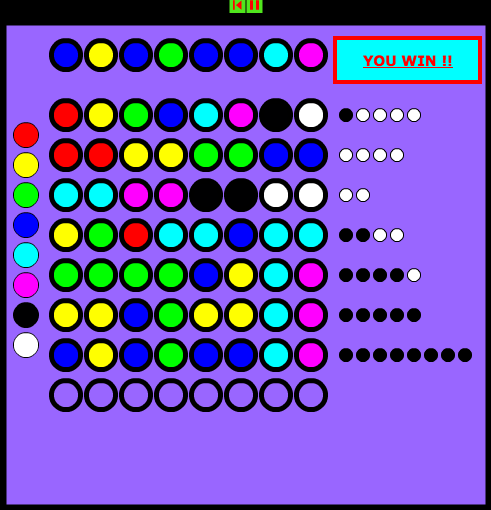 great game you made,i almost lost by wining in my final guess. 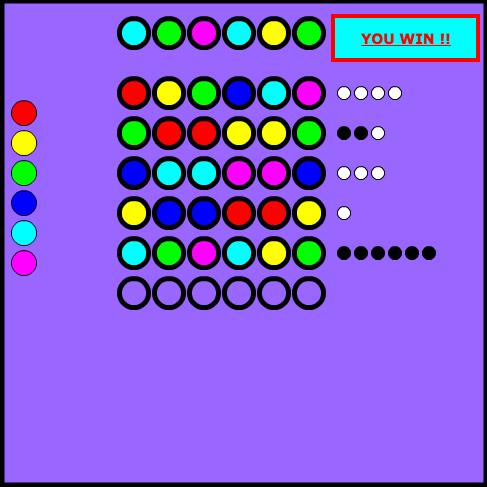 haha your right you can win by putting the pattern after its shown to you. great game and perfect implementation! Great, Bio! You've got some talent for making board games. As Xyuzhg pointed, it's actually a very complete version, needing no additions as I see it. I wonder if we can make a similar game with words? 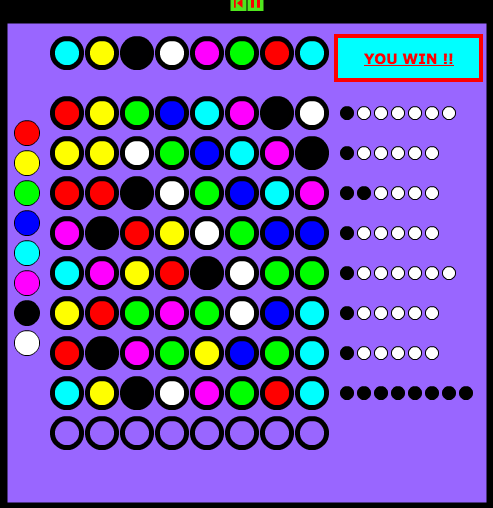 Say, have it to select a 5-10 letter word, each letter functioning as colors does in the original game. 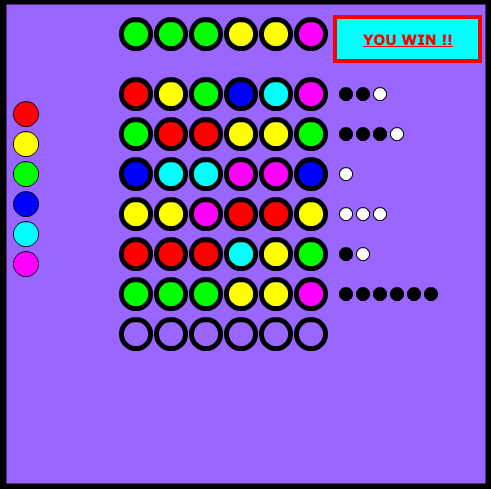 The attempts would still be 10, and the words would be longer than 4 letters, but the order and grammar every word has would ease up the finding of the solution, making the game fair. 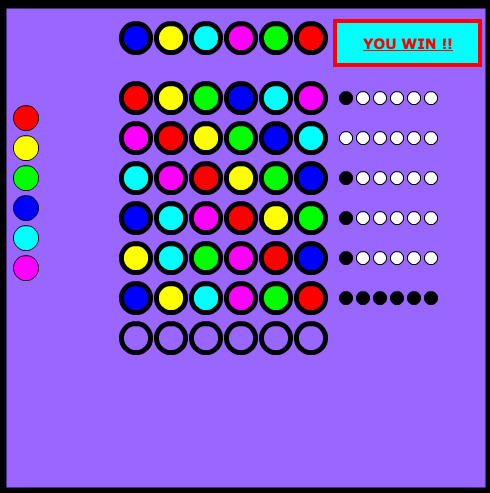 hey guys, so I've been playing this a lot recently, and I haven't lost once in like 200 games, so I added a 9th colour, but I swear that made the game easier... what do you think? I'm thinking of adding a 5th position to the game, what are your thoughts on that? It's hard to say if adding another colour has made the game more difficult or not when I find all the colours so easily... someone with worse luck please help. I will also add multiplayer soon too. Hmm, I myself got my own fair share of luck and unluck. By multiplayer do you mean one computer or multiple computers? Let's stop here now. 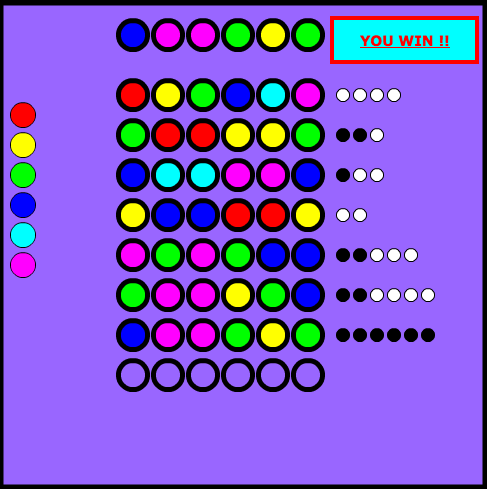 Since the "2" is accurately identified, guesses 2, 3, and 7 give insight into the location of the 1. In particular, 2133 has one digit in the correct place. That digit is not the 2, so it must be the 1. Thus I guess 8128, which is a lucky win. 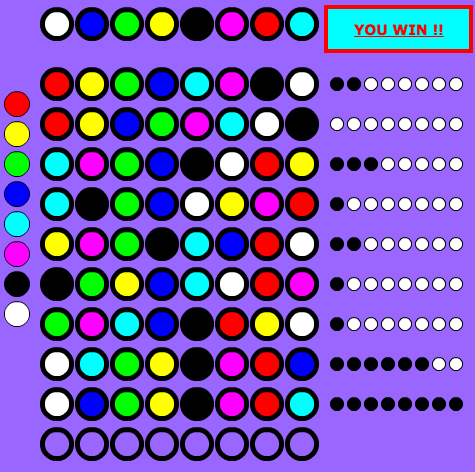 As you can see, this took ten guesses. I'm sure if I optimize this I can guarantee at most ten guesses (eleven if the digit 0 is allowed). I have heard a minimum of five, but I think that's for six or seven digits. Mathdude... i feel that method would take an extremely long time to figure out with more colours. 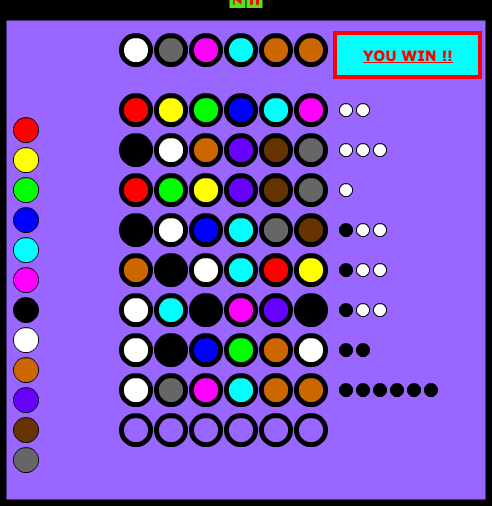 I have yet to be defeated by the 9 colours and almost feel as if it has made it easier... I've always had at least 2 spots left when I win. still can't tell if it is easier tho or I've just been lucky. Going to add a 5th hole and another colour when I have time. Okay Everyone, I said I wanted to do this and it's been some time but I'm finally done! You can now select up to 12 colours and 8 locations. Repeat colours is also now an option to turn off if you want only one set of the colours. 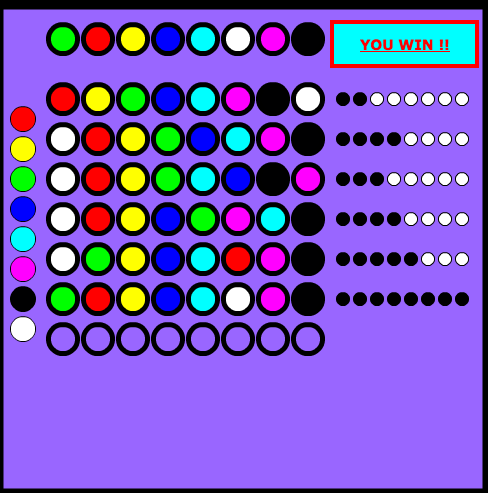 Using 12 colours is quite hard! I haven't tried too much yet, but let me know what settings you like playing on! If you dislike the colour choices and would like to recommend different shades or colours then please let me know what HEX values you would like to see instead. 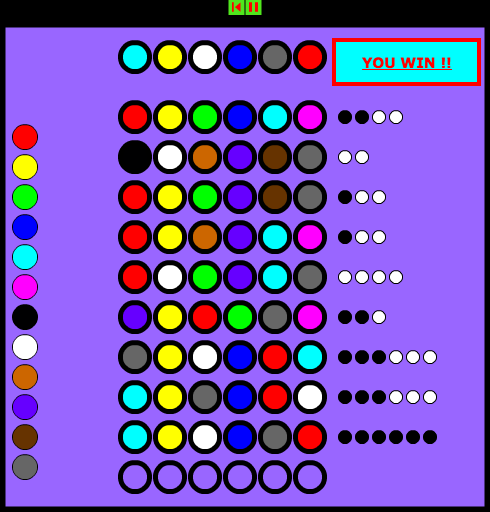 Here's a round I played, 8 colours, 8 spots, no doubles. 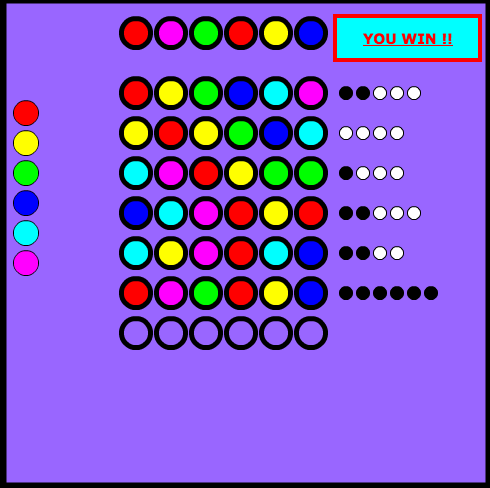 ... kinda dissapointed no one else has commented on this since I made the expansion to 12 colours and 8 slots... but here's some more example wins I got. I think it's a pretty cool expansion. ^^ Looks much more difficult. It's cool though, because games tend to last a little longer then they did with only four. I've been playing this a lot and have added MANY more example images to the first post if anyone is interested. what colours did you want to change?